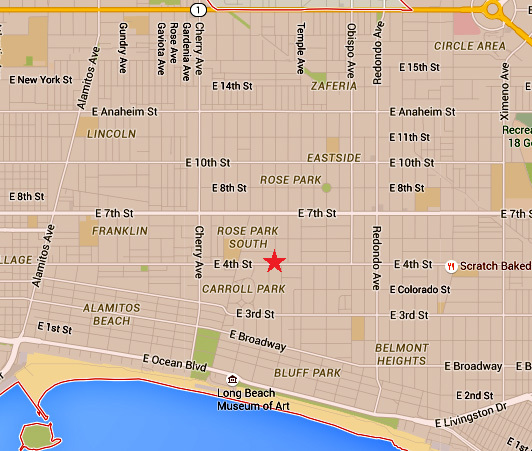 We are located in the Bluff Heights neighborhood of Long Beach, CA. The exact address will be provided when you call for an appointment. Take the 7th St./ CA-22 west exit. Take 7th St. to Redondo Av. Turn left on Redondo. Turn right on 4th St. Remainder of directions will be provided when you call for an appointment. Take the Long Beach (710) Freeway southbound to its end, following the signs toward the Aquarium. Follow Shoreline Drive around until it meets Ocean Blvd. Turn right on Ocean Blvd. Take Ocean to Junipero Ave. Turn left on Junipero. Take Junipero to 4th St., turn right. Remainder of directions will be provided when you call for an appointment.